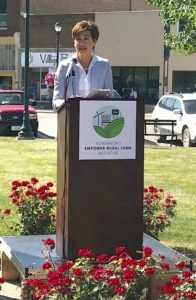 Governor Kim Reynolds has signed an executive order creating task forces to address the lack of housing and broadband in rural Iowa. The “Empower Rural Iowa Initiative” also seeks to develop leaders in rural parts of the state. Reynolds hopes to name the members of the three task forces by August 1st. If you’re interested in serving, you may apply on-line at www.openup.iowa.gov. Adam Gregg, the acting lieutenant governor who is Reynolds’ governing partner, is co-chair of the initiative. Sandy Ehrig of the Iowa Rural Development Council is the other co-chair. She said the new group will hopefully address a critical need in rural Iowa. “Everybody is working or trying to work on housing in our rural places,” she said. The Iowa Rural Development Council has already held summits in Jefferson and Grinnell for rural communities. The newly-created task forces will start meeting this fall and will host an “Ideas Summit” — but the date for that has not been announced.